When RESOLVE was just a fledgling, we ran two posts from Greg Gibson titled “It’s never too late to start a personal project.” Since then we’ve seen so many great personal projects, and heard about even more that are still just ideas. By highlighting our faves in this new “It’s Personal” column, we hope to encourage more photographers to turn their great idea into a great personal project. 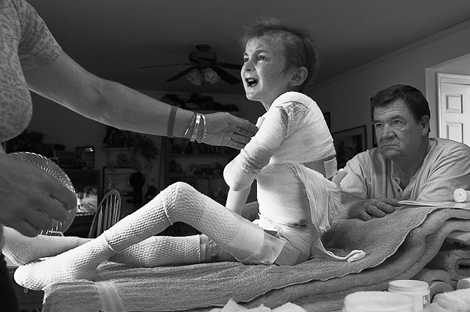 Garrett: The Boy Beneath The Bandages — Epidermolysis Bullosa, or, EB, is a rare genetic skin disease that most people have never heard of, yet it affects 100,000 children across the United States alone. Children born with this disease lack the ability to produce the collagen-7 protein that acts as a glue to bind the inner and outer layers of skin together. Their skin is extremely sensitive and fragile, with open wounds similar to third degree burns that never heal. The slightest friction or bump causes the skin to blister and break down. EB kids live relatively short lives, wrapped in bandages and in constant pain. This series of images tells the story of a 12-year-old boy named Garrett, his family, and the challenges they face every day because of this debilitating disease. EB not only takes a toll on its victims and their families, it also affects their friends, caregivers, and the communities that help them. Through these images, I will attempt to give a face to this horrific and unpublicized disease. When and why did you start it? I started work on this story in 2008 as my thesis while pursuing a masters in photography at the Academy of Art University. During the summer semester of 2007, I answered an ad on the school’s job board. A nonprofit organization that ran a week-long summer camp for kids with genetic skin disorders needed a photographer. I jumped at the opportunity. During the week of camp, I met Garrett and his family. I had never heard of EB. In a weird way, I feel like this story found me. Everything just seemed to fall into place. Garrett’s family and I both recognized this as an opportunity to gain much needed awareness for the disease. I pitched the idea to them. I was nervous because I was asking them to enter a 1-year+ commitment without knowing much about me. They agreed to the idea, and here we are today. Do you have a particular image you are especially drawn to so far? This is a tough question. The image above is the decisive moment of the story. It’s said that a picture is worth a thousand words. In my opinion this photo is the story. This image shows the pain and suffering this kid lives with every day. His bandages, which act as a protective layer, must be changed three times a week. Imagine having your skin peeled away every couple days, and you start to get a hint of what Garrett goes through. What has been the most challenging thing about the project? First, due to Garrett’s limited physical activity, he spends much of his free time sitting on the couch, watching basketball or playing video games. I often found myself reshooting my own images, fighting with repetition. To overcome this challenge, I had to become extremely aware of Garrett. I had to learn to slow down and pay attention, yet move quickly to decide what to do with those moments when they happened. For example, wide angle, medium angle, close-up, or extreme close-up of Garrett’s body, an eye, mouth, expression. Second, photographing in the chaos of someone’s home, where I can’t control the positioning of furniture, pictures, clutter, etc. It took me some time and patience to finally resolve this. Thankfully this story was so forgiving. I had the luxury of returning a couple times per week to work on it. What has been the most rewarding thing about it? Many times before, neighborhood kids, classmates, and community parents had asked if they could use Garrett as a topic for their science projects and reports. Deeply angered, she told me, “I really didn’t like the idea of reducing Garrett to a ‘science project. '” After seeing the photographs I was creating, witnessing my growing dedication to EB, Lorraine was quickly won over. She gave me her complete trust and allowed me into their private life. In your ideal world, where would this project end up? If I had it my way, this story would be shown in National Geographic (black & white), Washington Post, New York Times, and every other major media outlet, where it would get the attention it deserves. In my ideal world, this story would travel from city to city, from gallery to gallery. This is a rare genetic skin disease that only affects children. Skin is our body’s largest organ, and the one we most take for granted. People need to see Garrett and be aware of this disease. Maybe we would stop taking things, like our bodies, for granted if we saw what a year in Garrett’s life is like. Do you recommend personal projects to other photographers, and why? Absolutely. They are an opportunity for release. They offer a chance to do what we do best, often without the time and budget restrictions that hinder other jobs. We are free to choose topics that mean something to us personally. They help us grow as people and as professionals, and they help us form relationships and friendships that last beyond the end of the project. Be Part of the RESOLUTION: Do you have a personal project or know of one that you’d like us to highlight on RESOLVE? Add your suggestions to the comments or email us. I heard this wasn’t happening anymore… maybe check the nycphotoworks website. Amazing work! The pictures tell a very painful story. Bravo André, your photographs give us the reality of this kid and all kids out there with this disease. Beautiful work and Amazing project.